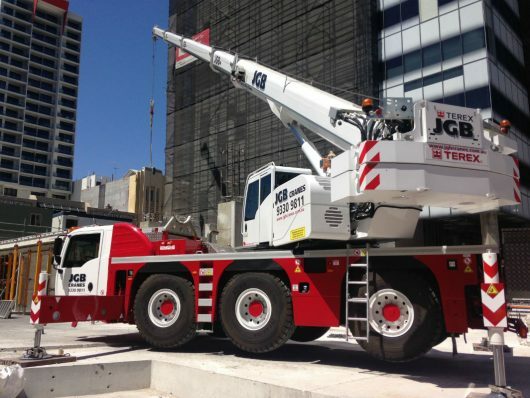 JGB Cranes extensive experience in the construction, mining and industrial trades has seen our company grow steadily over the past 18 years in business. Our focus on safe, reliable, lifting solutions for your business is our business directive and 100% Customer Satisfactory is our goal. At JGB Cranes we have a motto “no job is too big or too small” . This means from lifting your bricks and steels onto your next home build, to lifting heavy machinery in limited access areas, to lifting chillers onto 25 storey buildings in the CBD – we’ve got you covered.JGB Cranes offer 24 hours a day, 7 days a week service and can provide a free assessment of your mobile crane hire requirements upon request, as well as detailed lift plans and traffic management solutions. JGB Cranes Riggers are second to none and can help provide the best solution for your next installation project.